Duquesne who played the first college game at Mellon Arena will also fittingly play the last. A while back, I wrote that I wished the City Game was played at Duquesne's campus this year instead of Mellon Arena because it provided a great small gym atmosphere similar to the old Field House. While I still partially wish that were the case, it's much better for Pitt to be playing downtown this year. I would have serious concerns about their ability to win in front of a hyped up crowd in a dangerous game. Heck, I'm still concerned about their chances tomorrow night. I was a little surprised when I saw that Pitt only holds a 20-14 advantage against Duquesne at Mellon Arena. Coach Jamie Dixon vividly recalls the last time Pitt played a regular-season game at Mellon Arena. 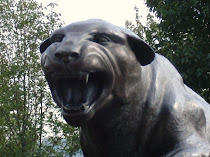 The Panthers fell to crosstown rival Duquesne, 71-70, eight years ago on a last-second shot in perhaps the strangest ending in the 77-year history of the City Game. "That was unique," said Dixon, who was an assistant under Ben Howland for the Dec. 21, 2000, game. "It was awhile ago, but I still remember it. 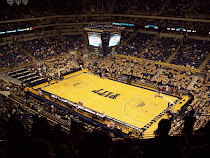 The game remains one of only three Pitt losses to Duquesne in the past 30 years, the others coming in 1988 at Palumbo Center and 1998 at Mellon Arena. One thing Pitt isn't used to is dealing with turning the ball over. That's not a huge surprise since they're playing so many underclassmen and a redshirt freshman is running the point. Oh, and that pesky rebounding problem may again rear its ugly head if Pitt can't contain Damian Saunders, who is the NCAA Division I rebounding leader with 15.5 per game. By the way, he can score, too, averaging nearly 17 a game. I'm not convinced that he's the best player in town. But even if he's not, it looks like the new and improved Gary McGhee will have his hands full. And speaking of McGhee, I don't think anyone will confuse him with Shaq, Kareem, or even Jack Sikma. But he's turned into a reliable center with good hands and those occasional alley-oops leave me a bit surprised when I see them. He can really be a serviceable player for Pitt and play a nice role while Dante Taylor is still learning and has looked uncomfortable at times. The game will be on the CBS College Sports channel and tickets appear to remain. Not going to the game and need some pre-game action? Check out the one-hour special that aired tonight and will also re-air on FSN tomorrow at 6pm before the game.